You already know that you can outsource your dry cleaning, but did you also know you can outsource your laundry too? Whether you have a busy family, or you’re a working professional you have better things to do than sorting, washing, drying and folding your laundry. Washing and drying a load of laundry takes approximately 1 ½ hours. If you home has only one washing machine and one dryer, you’re spending all day chained to the laundry room, switching the loads. And honestly, once you get everything clean and folded, your family has accumulated more dirty laundry. It feels like you will never get ahead of the game. Taking your laundry to the laundromat will save you quite a bit of time. There, you can wash and dry all of your loads of laundry simultaneously in multiple machines, cutting your time down significantly. It will still take about 1 ½ hours, but the rest of the day is yours. “Time is money.” You know the value of time and money, so you already outsource your housecleaning and many other tasks. As a busy professional, you realize how much you’re worth per hour, and outsourcing these tasks allows you to focus on what you doing best. Isn’t it worth it to have your laundry done for you too? At EZ Wash in Winter Park, we have two convenient options to help you save time and money. Our state of the art laundromat has an abundance of machines so you can get all of your laundry done quicker than doing it at home. Or, for an even quicker option, EZ Wash can wash, dry and fold your laundry for you. Just drop it off, and we’ll have it ready in a jiffy. The only question is, what will you do with all that extra time? 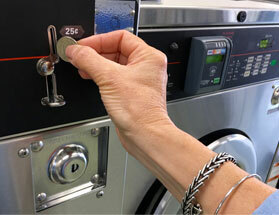 How can using a laundromat save you time AND money? At some point in your life you have probably used a laundromat to do your laundry. Maybe it was in your college years when you lived in an apartment complex. Or as a last resort when your washer and dryer were on the fritz. You probably think you need a laundromat only when you don’t have a functioning washer and dryer of your own. There are many more reason why anyone in Orlando or Winter Park should use a laundromat. On average, it takes an hour and a half to do a load of laundry at home, from washing to drying. Since you only have 1 washer and dryer, it could take all day to do a week’s worth of laundry. Who has time to be chained to their home to check on their laundry every 30 minutes? At a laundromat, you can do all of your laundry at one time, speeding up this weekly chore. You’ve now cut a job that takes about 20 hours a month, down to about 6 hours a month. Who wouldn’t want an extra 14 hours a month? If you’re a busy professional, doing laundry is probably the last thing on your To Do list, but it still needs to be done. Using a laundromat like EZ Wash in Winter Park that offers Wash, Dry and Fold service just makes sense. Drop your laundry off in the morning on your way in to work, and pick it up clean and nicely folded. Putting it away is up to you though! Doing your laundry at the laundromat is a very cost effective solution, when you factor in the funds that you spend on water and electricity. They say time is money, right? The time that you get back when your laundry is done in just a couple of hours is priceless. In addition, using the wash, dry and fold service costs less than what you would pay to do your laundry at home. You hire someone to clean your house because of the time and money that you save. Why not let EZ Wash in Winter Park do your laundry too? Share with us what you will do with all that extra time on your hands! 5 Helpful Tips to Make Your Swimsuits Last! One Year Down, Many More to Come!